The world has gone digital—including how job seekers are finding employment. In this “tech era” we talk, text and engage using social media tools everyday. In fact, over 70 percent of job seekers use their mobile devices to apply for jobs. Still not sold on the idea of going mobile? 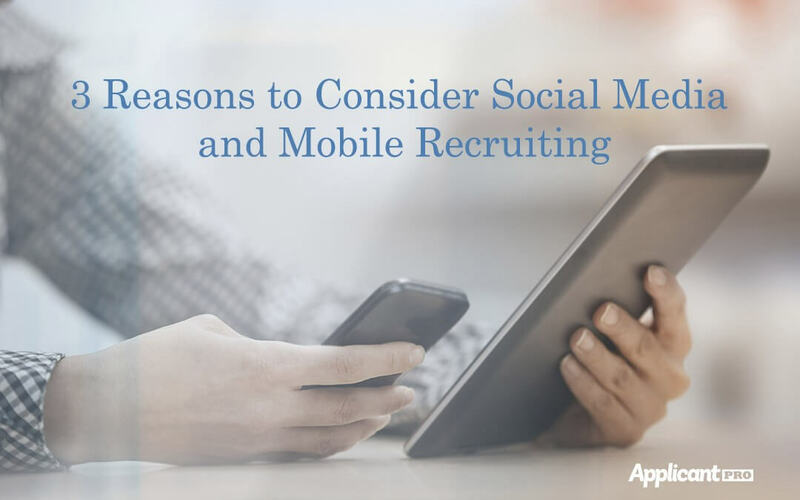 Here are 3 reasons why companies should consider using social media and mobile recruiting. Considering that Twitter had 236 million monthly active users in the first quarter of 2015, it’s not a bad place to start on your recruitment search. Social media is like a huge talent pool that employers can use to tap their next rock star employee. In a survey conducted by Jobvite, 44 percent of recruiters reported finding quality hires through social media recruiting. Getting social reduces the risk of talent shortage as it takes you where the candidates are. Posting on social media sites significantly increases the odds of finding well-qualified candidates without having to invest too heavily for publicity. Transparency is the topic of the town when it comes to understanding what employees want from their employers. Social media acts as a means for companies to identify their brands with their target audience. Think of it this way, instead of creating brand awareness for consumers, it’s more like brand awareness for potential employees. Having a social media presences allows candidates to know who you are, what your company is about, and if they could fit into the scheme of things. Creating a job posting is only half the battle—where you post it makes all the difference. Having software in place to position your job ads to highly trafficked sites is crucial to maximizing the exposure of the job ad. Posting on social media sites significantly increases the odds of finding well-qualified candidates without having to invest too heavily for publicity. The job market is competitive in terms of companies looking to secure the best and brightest for their teams. Organizations that are utilizing mobile and social media recruitment strategies have an advantage over those that don’t. Meeting candidates where they engage the most is a surefire way to find the rising stars for any industry. If you would like more information about advertising your jobs to social media, please contact us.